... a new paradigm of research communications has grown up – one that de-emphasizes the traditional journals route, and re-prioritizes faster, real-time academic communication in which blogs play a critical intermediate role. They link to research reports and articles on the one hand, and they are linked to from Twitter, Facebook and Google+ news-streams and communities. So in research terms blogging is quite simply, one of the most important things that an academic should be doing right now. But in addition, social scientists have an obligation to society to contribute their observations to the wider world – and at the moment that’s often being done in ramshackle and impoverished ways, in pointlessly obscure or charged-for forums, in language where you need to look up every second word in Wikipedia, with acres of ‘dead-on-arrival’ data in unreadable tables, and all delivered over bizarrely long-winded timescales. So the public pay for all our research, and then we shunt back to them a few press releases and a lot of out-of-date academic junk. Blogging (supported by academic tweeting) helps academics break out of all these loops. It’s quick to do in real time. It taps academic expertise when it’s relevant, and so lets academics look forward and speculate in evidence-based ways. It communicates bottom-line results and ‘take aways’ in clear language, yet with due regard to methods issues and quality of evidence. 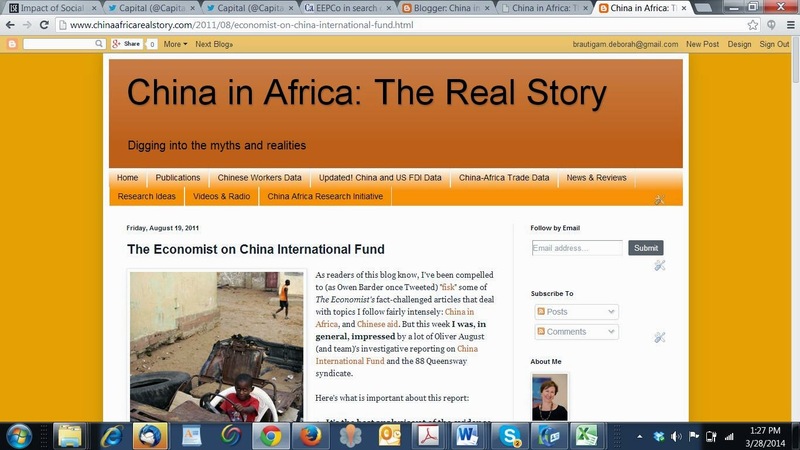 When I started the China in Africa: the Real Story in 2010, I simply wanted to keep doing what I had done in writing The Dragon's Gift: report on, and analyze, the realities of Chinese engagement in Africa. I didn't guess then that this blog would have over thirty thousand readers a month (we are coming up to a land mark: a million hits). I do continue with all the dry social science writing and publishing (and am trying to have the timescale be less "bizarrely long-winded"). But one thing the LSE academics left out: blogging is far and away the most fun part of my professional life! I don't blog but every blogger that I follow have written something similar. Also, the better blogs have made social science research better by flagging data mining and blind data usage in search of some causal claim. Too much of this still prevails but blogs like yours has made it harder to get away with. Thanks Dwayne. I appreciate your active engagement and the fact that you don't do it anonymously. On a serious note, I consider academics' blogs to be some of the most accessible introductions into subject areas that I am interested in but not well-informed about. Blogs like yours are wonderful resources. Of course, I meant to say that next to interacting with my students, blogging is the most fun thing I do professionally! Is China Looking at Africa for Greener Pastures?